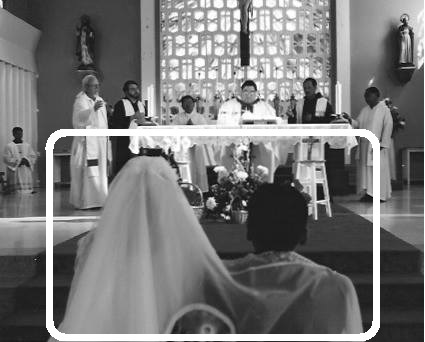 In a traditional Chamorro wedding, a veil or belo is draped over both bride and groom after they have exchanged their vows. 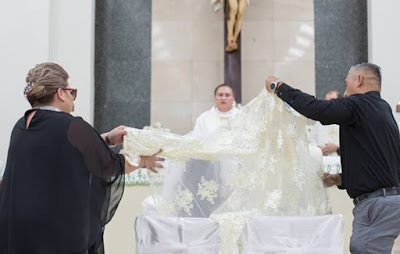 Just as the one piece of fabric covers both bride and groom at the same time, the belo symbolizes their union and also God's blessing (and that of the Blessed Mother or of the Holy Family) covering the newlyweds. How important was this custom of pinning the belo? Before the war, evidently very important. As this one story illustrates. This wedding took place in the mid 1930s in Hagåtña. The groom was Chamorro. His bride was mestisan Amerikåna, mixed Chamorro and caucasian. Her father was a statesider and her mother was Chamorro. Perhaps in order to accommodate wedding guests from the American colony on Guam at the time, the wedding took place late in the day, and not at the usual dawn hour. Americans on Guam were not accustomed to waking up at 4 or 5 in the morning. Chamorros at the time were. So weddings, in fact almost all Masses, were celebrated before dawn or at the crack of dawn. For whatever reason, the story never explains why, the belo was not pinned to the bride and groom at their wedding Mass late that day. I have a suspicion why, but it's only speculation. Perhaps the Spanish priests or the Chamorro mañaina (elders) felt that a late-in-the-day wedding was an agreeable compromise to allow stateside guests to attend, but that some tradition be maintained and that the belo not be put on until the following morning at the "completion," as it were, of the nuptial rites at the traditional, early hour. Bride and groom were expected to return to the church the next morning and get pinned with the belo . And that is when Mrs. Ana Underwood asked the father of the groom if the belo had been pinned at the wedding. The father replied that it had not, but would be the following morning at another Mass. Tan Ana'n Underwood then said, "Then make sure the bride and groom do not consummate the marriage until then." Any romance between the bride and groom would have to wait. The groom, in fact, did not sleep with his bride that night after the wedding. The next morning, Mr. Chester Butler, the bride's godfather, picked up the groom to take him to the morning Mass. He asked the groom if he and his bride had had a good night. The groom responded, "How could we? The belo is this morning so my wife went home last night after the fandånggo." Such was the importance of the belo in pre-war Chamorro weddings. You were not completely married, nor able to enjoy the blessings of marriage, until the belo was pinned on you and your spouse.